Brendan Rodgers is feeling good about life again after proposing to his girlfriend in Times Square and his wardrobe is reflecting that. Well, that or a devastating midlife crisis. Either way, he has developed into a budding fashion icon over the course of his unemployment and it’s time we all take notice. 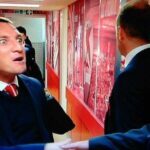 It’s only a matter of time before “Character” by Brendan Rodgers is a real fashion line in discount stores around the world.